In the Recovery Explorer tree pane or file pane select an item. From the Edit menu, click Open In Disk Editor. Right-click the item and click Open In Disk Editor from the context menu. At every application start, the Open Data Storage dialog appears. Select Disk, Partition or volume and click Open button to open selected item in editor. Double-click on any item in the tree view to open. Toggle Details button to show or hide detailed information about selected (highlighted) item. Use Ctrl+O shortcut any time after while using the editor or click File > Open Disk... command to open this dialog again. Disk Editor shows detailed information about the selected object in the information panel on the left side of the view. 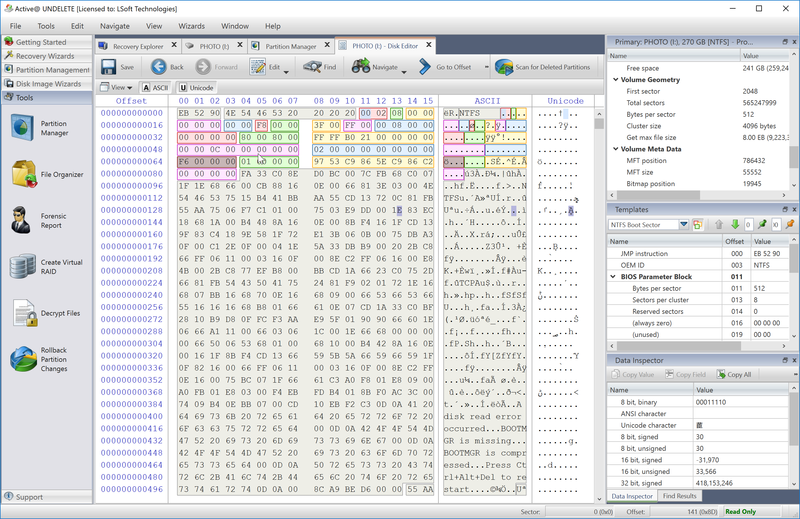 The right panel displays the binary and text view of the file. After the Disk Editor view appears, you may browse through the content of the open item using the scroll bar, keyboard arrows or the mouse wheel. Click either the binary area or the text area to focus on it. You may also use the Tab keyboard key to switch the focus between hexadecimal and text modes. As with any advanced tool, use extreme caution with the Disk Editor. Changes that you make may affect disk structure integrity. You must be certain that the changes you make are in line with correct data structures before you save changes. Disk Editor memorize its state and when closed those settings are preserved. The settings saved are view options and geometry of windows. Unless stated otherwise, all modifications made in the Disk Editor are stored in memory. Changes are written to the drive when you click Save.